A picture of the application that is found on the 9news website, under the community tab. 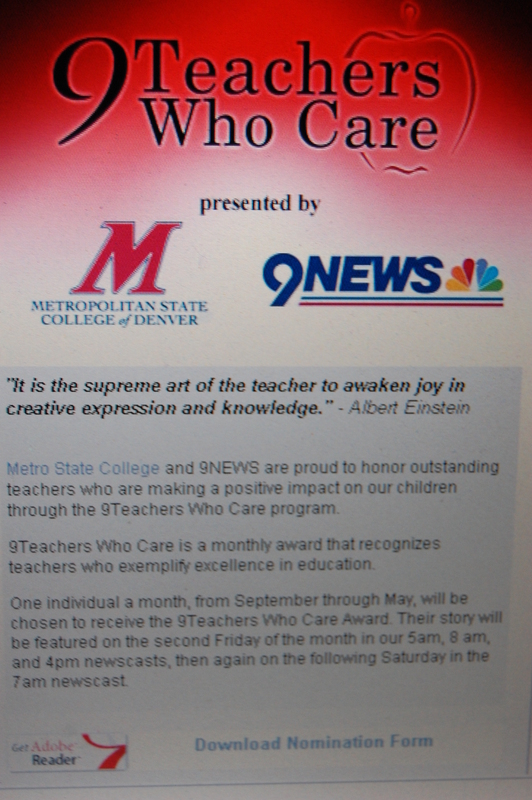 With the second Friday of October coming up, the monthly Channel 9 News Teachers Who Care award is going to be announced. This award is given to teachers who surpass expectations in making sure their students succeed in and out of the classroom. The program, 9 Teachers Who Care, started eight years ago after an internal meeting that discussed what could be done to help support education, said Lynne Valencia, who oversees the program at Channel 9 News. Then Channel 9 News contacted the Metropolitan State College of Denver to ask about a sponsorship because we, “thought it could be a good fit,” Valencia said. She explained there is a committee meeting where the applications, typically around 20 to 25, are read and discussed until a winner is chosen. As a sponsor, “Metro State has one vote on a large committee,” said Cathy Lucas, associate vice president of communications and advancement for Metro State. The committee is also made up of members from the community, past winners and parents. This brings many different perspectives and since it is, “so diverse I think we are picking really good winners,” Valencia said. These meetings are usually held in advance, which means the winner is already chosen before it is announced on the second Friday of the month. We don’t know the December winner, but we do know November’s, Valencia said. This is because arrangements for video segments, which can be viewed on Channel 9 as well as online, need to be planned and produced. “We have some great teachers in our state that received some well deserved recognition,” and “the program also elevates the profession of teaching,” Valencia said, explaining the best part of overseeing the program. I was very diappointed that your 9teacherswhocare is limited to teachers of children only. 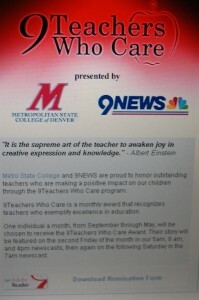 There are many excellent teachers or seniors who should be honored. Cindy Luebke, the credentialed director of the Wellness Center of Shalom Cares, is by far the very best, knowledgeable, caring and funny teacher I have ever had in my life (I am 65 years old). She teaches many classes for the older (55+) folks including aqua arthritis and fit classes, silver sneakers, balance, CIBEX, pickleball, yoga, tai chi, water dance, etc. Her continuing education of herself has added spice to these classes. I started 2 years ago going to the Center and have eliminated or decreased medications I am on, lost and kept off 35 pounds, increased strength and health and memory, and learned how to swim! What a kick! I am so very grateful to this wonderful, fabulous and involved teacher. So beautiful inside it spills out! Absolutely amazing. She has truly changed my life after retirement 2 years ago to pure joy. It is not just children who benefit from excellent teachers!